Rex Race Day Spray is an unique hydrophobic chain coating for bicycle chain and cassette. UNMATCHED DIRT REPELLENCY WITH UNIQUE HYDROPHOBIC PERFLUOROCARBON PTFE FORMULA. Rex Race Day Spray is a unique product for treating your chain and cassette by yourself, for extremely low friction and maximal dirt repellency. Rex is an expert in fluorocarbon coatings and we have decades worth of expertise in manufacturing products for cross-country race skiing. Now, we are the first in the world to bring the same technology into cycling. Together with our Domestique Chain Lube, Race Day Spray forms a lubrication solution with unmatched longevity and dirt repellency. The research and development for Race Day Spray was done together with the best athletes and world-known independent testing labs, to make sure the product meets Rex quality standards. Rex Race Day is manufactured at our factory in Hartola, Finland. THE TOUGHER THE CONDITIONS, MORE YOU BENEFIT. INDEPENDENT LAB TESTED AND PARIS-ROUBAIX PROVEN. Drivetrain noise and friction are lower from the beginning of application. (-1dB.) Drivetrain noise stayed -1dB lower during the 5h dyno test. A Race Day Spray -treated chain that had been ridden for 7 hours in “spring classics” weather, (dusty, wet gravel, asphalt), gained only 0,5 watts friction when measured post-race and appeared completely clean! Compared to a chain that has lost its lubrication in race, the advantage when using Rex Race Day Spray is three extra watts in finish line sprint. WITHOUT EVEN REMOVING THE CHAIN FROM YOUR BIKE. THE ONLY PRODUCT THAT YOU CAN ALSO APPLY ON CASSETTE. Until now, optimising your chain has required purchasing a pre-optimised expensive chain, which becomes a normal chain when the optimisation wears off. With Rex Race Day Spray, you can apply the optimisation treatment yourself without even removing the chain from bike. Instead of optimising only the chain, you can also treat the cassette for improved shifting and dirt repellency in extreme conditions. In addition it is also economical: A single can of Race Day Spray gives you three chain treatments for a lower price than one readily optimised chain! LAB TESTS VERIFY IMPRESSIVE PERFORMANCE. Fully cleaned chains were tested right after applying the lube, and then again after a six-hour race simulation with identical bikes and drivetrains. The test verifies what can also be heard and seen: A chain treated with Race Day Spray stays quiet, clean and efficient. After six hours of racing, there is 52% less drivetrain friction with Race Day Spray when comparing to a chain that is lubed with Rex Domestique only. And even the Domestique lube is one the most efficient and longest lasting lubes on the market! The longer you race and the worse the conditions are, the bigger the advantage is. No other chain coating or optimisation solution can match the hydrophobic capabilities of Rex Race Day Spray! The effect of Race Day Spray coating lasts for hundreds of kilometers. When the chain starts to sound dry, you can apply more Domestique Chain Lube. Before applying Race Day Spray again, clean the chain completely. AN ANOTHER CHAIN LUBE THAN REX DOMESTIQUE? The formula of Race Day Spray has been developed to work together with our Domestique Chain Lube, and their ingredients are designed to complement each other. We do not recommend using it with an another brand chain lube. Please note that Race Day Spray is a coating and not a lubricant itself, and requires the use of Rex Chain Lube. CAN I APPLY IT ON MY MOUNTAIN BIKE? 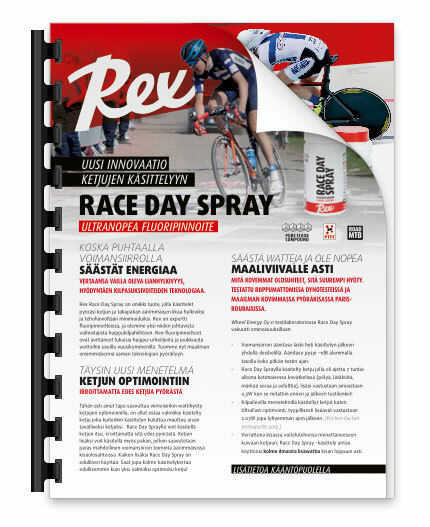 Rex Race Day Spray is designed to be used in all cycling disciplines. In MTB use, the dirt repellency capabilities of Race Day Spray keep the drivetrain cleaner in extreme race conditions, reduce drivetrain wear, and ensure good shifting performance. Perfect for 24-hour races in muddy conditions, and amazingly easy to clean afterwards just by wiping with a dry cloth. HOW DOES IT COMPARE TO ALTERNATIVE PRODUCTS? Rex Race Day Spray is the only product that can be applied also onto rear cassette also. This is a big benefit in rainy, dusty and muddy conditions. The drivetrain stays efficient longer and shifting quality is better. Competing chain optimisation solutions are not meant for wet and muddy conditions, but to minimise friction in laboratory setting. But no one races in laboratory! Optimising your chain just got a whole lot cheaper, and you can use your favourite chain too. The recommended retail price is 79,90€. For that you get 3 application times. No more purhasing an optimised chain for every race! Degrease the chain for example with a chain cleaner tool. If the chain is brand new, remove stock grease completely. Apply Rex Chain Lube generously (2-3 applications). This way we can make sure there is enough lubricant in the freshly degreased chain. Spin the drivetrain slowly to make the lube penetrate, wipe off excess lube from the surface of chain. Shake the Race Day Spray well before use. Spray onto chain from ~2 cm distance for a couple seconds while spinning the cranks backwards quickly, until the chain has rotated around once. Repeat also on the inner surface of chain near the top derailleur pulley. Let dry until chain appears white. When raining, apply also onto cassette. If you have disc brakes, protect the rotor. After drying, (about 10 min.) the chain and cassette appear completely white. What you see on the surface is an unique blend of perfluorinated waxes and PTFE. The quickly drying liquid carrier solvent makes the coating go inside the chain links very effectively.